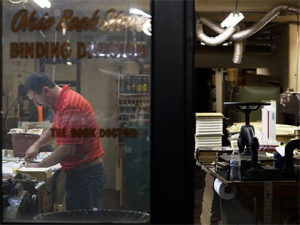 Check out the March 28, 2014 Enquirer article on the Bookstore and our Binding Department, featuring bookbinder, Mike Fallon! Article and photograph by Enquirer reporter, Cara Owsley. Because the Search is Half the Fun! The Ohio Book Store has FIVE FLOORS of books and magazines. You never know what you'll find, so come on in and explore all we have to offer. The Bookbinding and Repair Department offers restoration services for old books as well custom binding of books. We've been in operation since 1940, serving the Greater Cincinnati Community. Store Hours: Monday - Friday 9:00 a.m. - 4:45 p.m. | Saturday 9:00a.m. - 4:30 p.m.
Bindery Hours: Monday - Friday 9:00 a.m. - 4:30 p.m.